In The Health of Strangers Lesley Kelly returns once more to the darker side of Edinburgh. This is an Edinburgh living in fear following The Virus pandemic. The Virus is a mutant strain of the flu which has claimed the lives of over a million people in the UK alone. The Health Enforcement Team has responsibility for following up on anyone who has missed their monthly health checks. They are not popular, especially amongst those who think The Virus is some sort of government run conspiracy. Now normally I wouldn’t say I enjoy dystopian novels but this must be just a little bit dystopian because I certainly did enjoy it! I think that part of the reason is that I could envisage this kind of scenario happening. We have all heard about the Ebola virus which killed so many in Africa, have been warned about the possible dangers of bird-flu and more recently read about the Zika virus in South America. Doctors warn us that antibiotics are losing their effectiveness and that a pandemic of this nature is likely. So it was intriguing to read about this imagined world, where people try to virus-proof their homes, everyone has to carry their health card and everyone knows someone who has died. As I would imagine would happen, conspiracy theories begin to arise, people start to look for alternative therapies and grasp at possible cures no matter how bizarre they may seem. It all seemed scarily plausible. I also enjoyed getting to know the Health Enforcement Team as they carried out their thankless tasks, trying to track down two young students who had gone missing. Along the way they discover cults, infiltrate secret gatherings, uncover German government interference and investigate possible drug dealing. Bernard, Mona and Maitland all had their own reasons for working in the HET and all had secrets in their home-life they’d rather not bring to the office. This unlikely group of colleagues were all intriguing in their interactions with each other. I was pleased to see from a sneak peek at the back of the book from Lesley Kelly’s next novel, Songs by Dead Girls, that we will get to meet them again and I’m looking forward to getting to know them better. 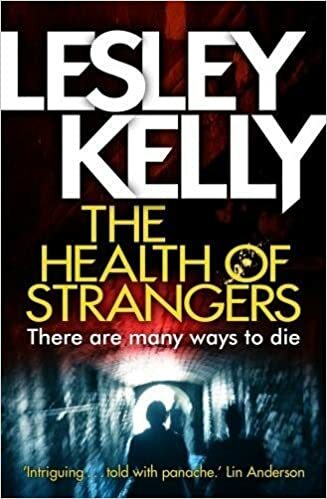 The Health of Strangers is another great read from Lesley Kelly. It’s well paced with strong storylines, a frighteningly plausible plot and entertaining banter between its main characters throughout. The author is taking no chances! Nobody likes the North Edinburgh Health Enforcement Team, least of all the people who work for it. An uneasy mix of seconded Police and health service staff, Mona, Bernard and their colleagues stem the spread of the Virus, a mutant strain of influenza, by tracking down people who have missed their monthly health check. Now two young female students are missing, raising question after question for the HET. Why were they drinking in a biker’s bar? Who are the mysterious Children of Camus cult? And why is the German government interfering in the investigation? Mona and Bernard need to fight their way through lies and intrigue, and find the missing girls – before anyone else does.